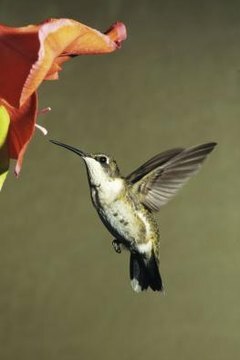 With several species of hummingbirds roaming the skies, you may think determining if the zippy little bird at your favorite flower is male or female would be difficult. In fact, picking out the male or female within most bird species is rather simple, look at the color. With a little guidance, you can become a pro hummingbird watcher. Like most birds in the wild, male hummingbirds wear the bright colors and the females are dull and drab, making them easy to distinguish. According to the Scientific American website, Charles Darwin believed the bright colors of the males help attract favorable mates. The theory that females believe bright colors indicate health and vitality may provide backup for this theory. However, other theories state that the female birds are more susceptible to prey animals when nesting and bland colors help them to blend in with the environment. These breeds of hummingbirds are named for their unique colored throats. The male ruby-throated hummingbird has a glowing, bright red throat. The blue-throated male has a dark blue colored throat that appears black in dim light. The female ruby- and blue-throated hummingbird is fairly colorless. The blue-throated female has a rounded tail with light gray or white corners. The magnificent hummingbird is one of the largest hummingbirds reaching up to 5 inches in length, according to the U.S. Geology Survey website. This breed is also known for brightly colored males. They have a green throat, which also may look black in dim or poor lighting, a black breast and a purple crown. Again, the female wears the dull gray color and has a dark, round tail. The rufous hummingbird lives up to the name, which means rust, or brownish-red colored. The male is brightly colored with orange, or rufous, and green feathers. He has a bright red throat and an iridescent orange back and belly that sets him apart from the female. The female, on the other hand, has green on her back with a small spot of orange on her throat. The Anna’s hummingbird is stocky and medium-sized in the hummingbird species. They are mostly covered with green and gray feathers. However, unlike the female that has a solid colored head, the male has a brightly colored head and throat covered with bright pink or red feathers, according to the Cornell Lab of Ornithology website. Scientific American: Why are Male Birds more Colorful than Female Birds?